Ok, so here is my first update on my experience with green bean coffee bean extract. I have only lost 1 lb. But what I have noticed is my skin looks even better on this stuff. I went to David Wolfes site, Longetivity Warehouse, and read what he had to say about it. Here are a few of his comments. Green coffee bean extract is touted for its anti-oxidant, hypotensive, anti-inflammatory and anti-obesity properties. It offers a potent source of plant-derived antioxidants and is rich in several polyphenols, which act to help reduce free oxygen radicals in the body. The two most prominent acids are chlorogenic acid and caffeic acid. Chlorogenic acid is a compound present in coffee which has been long known for its beneficial properties. It is an antioxidant, which means it destroys the free radicals formed in the body as a result of metabolism. These free radicals if left as they are, destroy cell membranes and contribute to symptoms of aging. By destroying these harmful free radicals, green coffee bean extract actually slows down the onset of aging. The chlorogenic acids present in the extract also help alleviate high blood pressure levels and can be helpful in treating hypertension. By neutralizing free radicals and regenerating vitamin E, Green Coffee Bean Extract has been shown to inhibit lipid and LDL peroxidation, thereby promoting cardiovascular health. Because this green bean has not been boiled, it lacks cafestol, which is a diterpene. Cafestol is associated with the negative effects of using coffee as a stimulant, and increases the levels of bad cholesterol or LDG. Green coffee bean extract has also been found to promote weight loss. This weight loss is due to the natural chemical compounds, caffeine and chlorogenic acid. The caffeine from the coffee releases fatty acids from stored body fat, while the chlorogenic acid assists the liver in processing the fatty acids more efficiently, which together contribute to weight loss. Also, the green coffee bean extract boosts metabolism by altering the way in which glucose is absorbed in the body. The caffeic acids act as a stimulant and boosts the energy levels as well. Green Coffee Bean Extract promotes glucose regulation and balance by inhibiting the activity of glucose-6-phosphatase, an enzyme involved in the release of glucose from liver stores, thus slowing the release of glucose into the blood. Green coffee bean extract is made from the green beans of the coffea Arabica plant. There are two types of coffee plants, arabica and robusta. 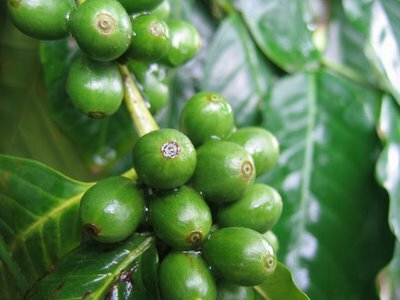 The arabica is higher in quality and higher in chlorogenic and caffeic acids. Test results show that green coffee extract has double the rate of oxygen radicals absorbing capacity as compared to grape seed or green tea . I believe that because green bean coffee bean has such a high level of antioxidants it is the reason that my skin is thriving on this supplement. I am going to take it for the full 12 weeks and see what happens next. I will keep you updated!! !